I have been going for walks as soon as the sun comes out- these days as it has been rare but it has given me a new appreciation for nature, and even decay. Japanese poets traditionally used haiku to capture and distill a fleeting natural images such as rain falling or a flower bending in the wind. Many people go for walks just to find new inspiration for their poetry, known in Japan as ‘ginkgo walks’. This weeks poem was inspired by David Bowie who left the earthly abode last week. We are so lucky in late spring to be blessed with wildflowers- many of whom are cousins of cultivars. These are free, abundant and hardy. While we have to be careful in picking these- for example, the Euphorbia shown here is a laxative!- we can still enjoy them whether in the garden or in a vase in our room. I find these more delightful than cultivars- they seem to be naughtier, tinier cousins-daring you to pick them up. It was my son, in fact, who noticed the Butterfly bush with its deep scent- much nicer than any perfume or room freshener you could buy! 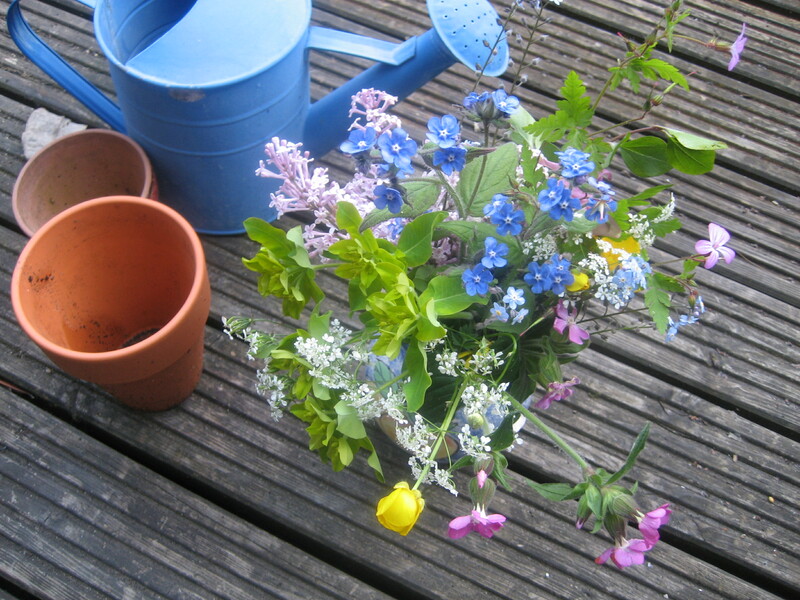 Such bits of wild spaces in the city attract bees, butterflies and birds- I heard the most delightful singing of birds when I was picking these flowers up. As birdsong has decreased by 60% in the UK, wildflowers and spaces are the right thing to have in your garden. Even one small container or pot with wildflowers will attract bees and butterflies as I know. Categories: Uncategorized | Tags: abundant, bees, birds, buttercup, Butterfly bush, container, Euphorbia, field genetian, forget me not, free, garden, Green alkanet, hardy, Mountain crane's bill, natural, patios, room freshener, spaces, Spring, sweet cicely, wild, wild geranium, wildflowers | Permalink. 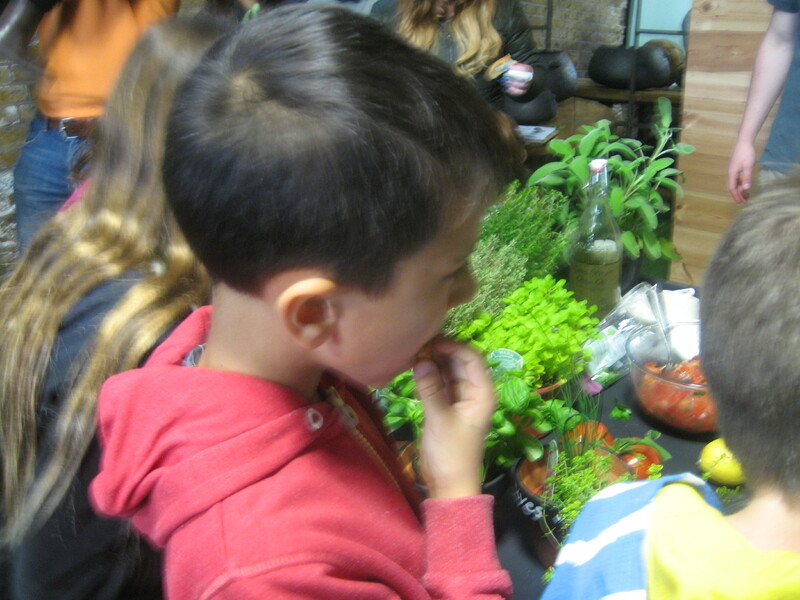 This is a photo of my son, trying out some bread with herbs made at a gardening workshop. Once children get into growing things and tasting them, they become not only keen gardeners but less fussy eaters. Children are very tactile creatures, observing, tasting, smelling any thing they can. I was surprised to see my son trying out the flavours of different herbs. Last week, he went to a pizza making party and told me he put mushrooms in his pizza which he used to hate in the past. The peer pressure of other children also helps! So take your children gardening, and if it is safe, let them feel and taste herbs. It will make them good eaters for the rest of their lives. Categories: Uncategorized | Tags: children, feeling, flavours, fussy eaters, gardening, herbs, party, tactile | Permalink. I never believe how hardy some plants are. These are my new mint plants coming through in the spring. 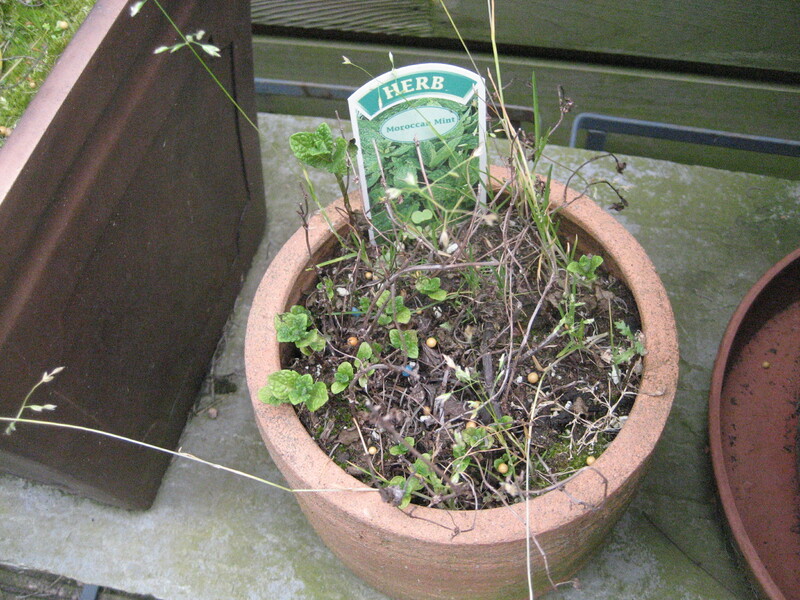 I had forgotten to water them last summer and snow had covered the pot in winter. But again, here I see that the mint comes up again and again. The mint teaches me a lesson of resilience and hardiness! Per weight, herbs are more expensive to buy from the market. So to be canny saver yet lazy gardener, I grow herbs more than vegetables which are need more care and space. Herbs take up very little space, can grow indoors and outdoors, protect other plants and provide amazing flavours to the food. They also look very pretty, attract bees and smell good! Categories: Uncategorized | Tags: attract bees, canny, expensive, herbs, lazy gardener, market, pretty | Permalink. In the spring, amazingly beautiful weeds spring out of nowhere. People seem to not like or enjoy the beautiful colours they bring- with no effort or cost. 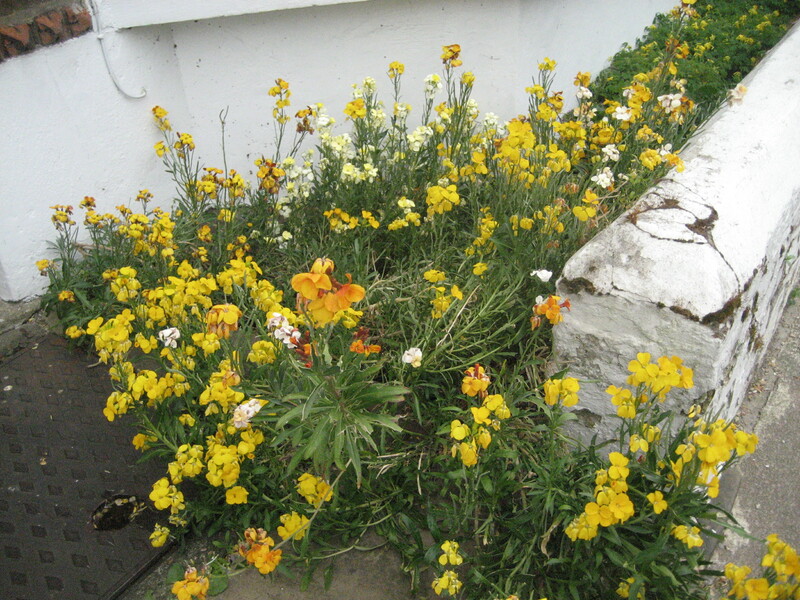 These weeds grow anywhere, cracks and crevices, with no need for watering or fertilisers. They seem to be very hardy and resistant, coming up every year, despite being pulled out all the time. In spirit of these resilient creatures, I thought I should let them stay and play in my garden too. Some are quite useful like the nettles (soups) and chickweed (for salads) and they grow in my garden, welcome and cheerful. Below is a photo of a house nearby with its gloriously sunny and hardy crop of ‘weeds’ that never fails to bring a smile to my face. Categories: Uncategorized | Tags: chickweed, garden, grow, nettles, resilient, sunny, weeds | Permalink.